Reportedly developed using highly advanced scientific research and combining it with traditional herbal remedies, Melozide is claimed to provide quick relief and recovery. Being non-steriod based, it is labeled effective for both internal and external hemorrhoids as well as many other anorectal disorders, such as fissures, abscesses, and eczema. 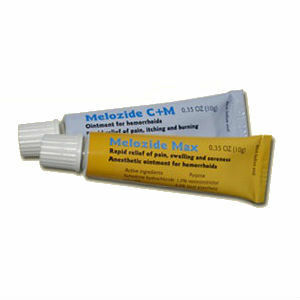 Despite the high level of belief the manufactures publically place in their product, they have not published the ingredients found in either Melozide MAX or Melozide C+M. Following suite with their neglect to publish the Melozide formulas, they also offer no information that would indicate healthy dosing. With no dosage instructions, no list of contents, the red flags on this product are rising high. Both Melozide C+M and Melozide MAX can be purchased for $26.90 with free shipping when you purchase two packages or more. Melozide does come with a 30 day guarantee, however the steps to take to have that guarantee honored are not clearly defined, if at all. There are a lot of scams out there when it comes to products like this, which is why we conduct the research that we do.The Melozides do not provide any information as to what is used in the formula, and do not provide any dosages. John Parker	reviewed Melozide C+M And Melozide MAX	on October 22nd	 and gave it a rating of 2.